How often do you eat together at a table? Find out why family mealtimes are so important, and how you can make yours more enjoyable. It’s very easy, in a life already packed with school, work, homework, play dates, after school clubs and more, to go for the easy option. And when it comes to mealtimes, the easy option is to feed our family where, when and what we can. Often this involves unwinding in front of the TV together, or eating in shifts, staring out our phone as we dine alone. But while this may have become the norm in many homes across the UK, it’s not ideal. Recent studies show that where your child eats could be just as important to their wellbeing as what’s on their plates. So why is eating together as a family so important? Studies show that eating together at the dining table can be hugely beneficial to school-age children. Not only can it boost their vocabulary more than being read aloud to, but it appears that family dinners help them perform better at school than doing homework, playing sports or doing art. Eating at a table and having a positive interaction are also associated with stronger and more positive feelings that can overpower the tendency to overeat. This is confirmed by studies suggesting that eating in the kitchen or at the dining room table, and remaining at the table until everyone is finished eating, are associated with lower BMIs for parents and children. Eating together as a family is associated with a higher intake of nutrients linked to improved health — such as fruits and vegetables — and a lower intake of items that are recommended only in limited amounts (for example, soft drinks, fried foods) too. 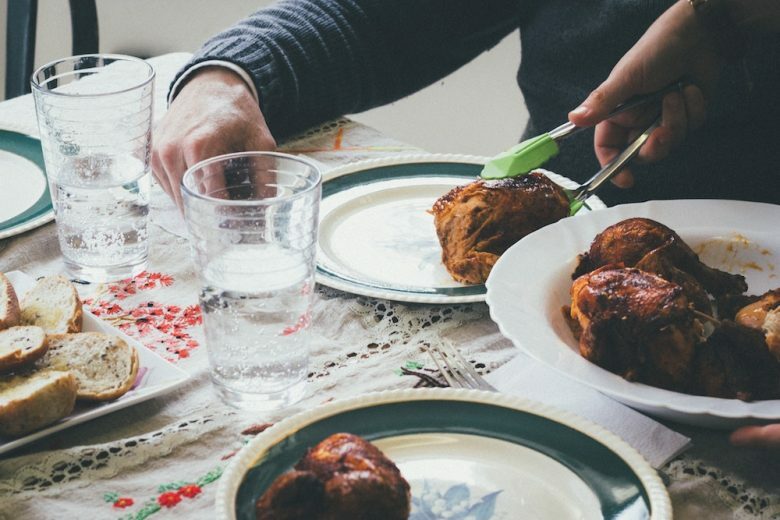 The latest survey into British family eating habits by Furniture Village, however, has revealed an ambivalent relationship with meals and nutrition. When asked where they enjoyed eating the most, one in three of the 2,000 UK residents surveyed chose the dinner table. 70% even went to argue that family relationships are positively affected when eating around the dining table, as are a child’s development (38%) and general mental health (28%). However, like may things, what works in theory doesn’t always translate in practice. And, despite our best intentions, the majority of UK families (41%) admitted to preferring to watch TV while they ate. So why are we not sitting around a table together, despite knowing it’s the best choice? 54% of respondents said it was because they preferred watching TV to talking. This was closely followed by spending time on their phones and other technology (42%) and late working hours. What are some families doing differently? So what can we do to change things, and reap the benefits of regular family mealtimes? Families who frequently manage to eat together have created a family mealtime culture. This helps to set the expectation that family members are there for meals, and as a result have developed a structured mealtime routine that includes a regular time to eat, and routines like setting the table. They also communicate work and after-school schedules as a family, so they’re aware of when everyone is likely to be home, so mealtimes can be planned around that. Other parents indicated that a strategy they used to overcome resistance to family meals was making them more enjoyable and minimising mealtime stress. Create a more attractive dining space. Eat together at a kitchen table or dining room with the TV off. Develop a routine: set the table, and institute a regular time to eat each day. Serve foods that children enjoy (serve sharing platters). Get children involved in food preparation and shopping. Keep mealtime conversation fun and interesting for the whole family. Encourage children to talk meaningfully about their day. Keep the area a tech-free zone. With just a few changes to your after-school routine, it’s possible to create a fairly regular family mealtime schedule which reaps all the mental and physical developmental benefits for your children and you. You can read more information on how to action Stephanie’s top tips, and find the full research into British eating habits here.